For the AI counterpart, see Gorefast (Killing Floor 2). The player-controlled Gorefast is one of the playable ZEDs in Killing Floor 2's Versus Mode. The Gorefast's role in the ZED team is that of a damage dealer, with a wide range of powerful attacks that hit fast and hard with good range. The player-controlled Gorefast is one of the most durable ZEDs on the roster. 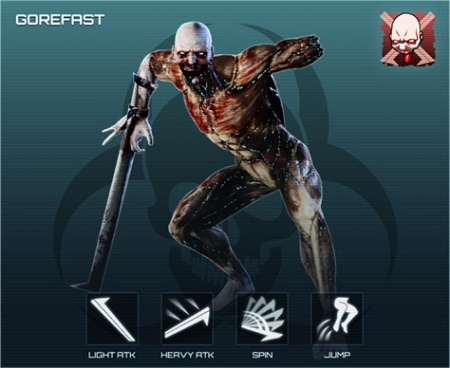 Due to Game Conductor mechanics, player-controlled Gorefasts have their health modified based on the average level of the Survivor team. Values vary within (x0.85 - x2) range. Player-controlled Gorefasts resist to every damage type and only weak agains very few tier 1 weapons. Gorefasts are resistant to all forms of damage - least to some of them (slashing, bludgeon) and most to other (explosive, toxic). Gorefasts resistant to every type of ballistic weaponry. Gorefasts are extremely vulnerable against Firebug's Caulk n' Burn and heavy (blunt) attacks of Berserker's Crovel Survival Tool. Gorefasts are neutral to Commando's AR-15 and are notably vulnerable against default 9mm Pistol, Field Medic's HMTech-101 Pistol and certain shotguns. Gorefasts have only one weak spot, which is the head. Although the damage multiplier is miserable. Their bladed arm deflects attacks. Primary / Secondary (while airborne): Slashes vertically downwards in one swift motion. Primary: Quick 2-hit slashing combo, can be done while moving. Primary + Sprint: Ducks then performs a sweeping slash with a wide arc. Secondary: Leap forward and slash vertically downwards in one swift motion. Secondary + Sprint: Performs 3 slashes while running forward. Bash: Spins blade in the air twice dealing damage in a circle, a stationary attack. Bash + Sprint: Sprints forward while spinning the bladed arm in the air dealing 3 highly damaging hits. AoE attack. Damage - 14. Maximum hit range - 1.92m. Vs doors - x5 more. Cooldown - 1.27s. Block. Damage multiplier (firearms) - x0.01, Damage multiplier (melee) - x0.25. Cooldown - 0.2s. Heavy attack. Damage - 14. Maximum hit range - 1.92m. Vs doors - x5 more. Cooldown - 0.52s. Light attacks. Damage - 14. Maximum hit range - 1.92m. Vs doors - x5 more. Cooldown - 0.25s. AoE attack: stationary - x0.7 (14 hits per attack) / sprinting - x1 (5 hits per attack). Heavy attack (running) - total of 12 hits: 9 of x0.3 and 3 of x1 (across all directions). Heavy attack (walking) - x1 (1 hit per attack). Jump attack - x1 (1 hit per attack). Light attack (running) - x1 / x0.7 / x1 / x0.7 / x0.7 / x0.7 / x0.7 (7 hits per attack across all directions). Light attack (walking / stationary) - x0.8, type 1 - 10 hits per attack (across all directions), type 2 - 2 hits per attack. Player-controlled Gorefasts start spawning at the second wave of the normal versus game. When blocking, Gorefasts are extremely resistant to ballistic weaponry and only take 1% of all incoming damage.